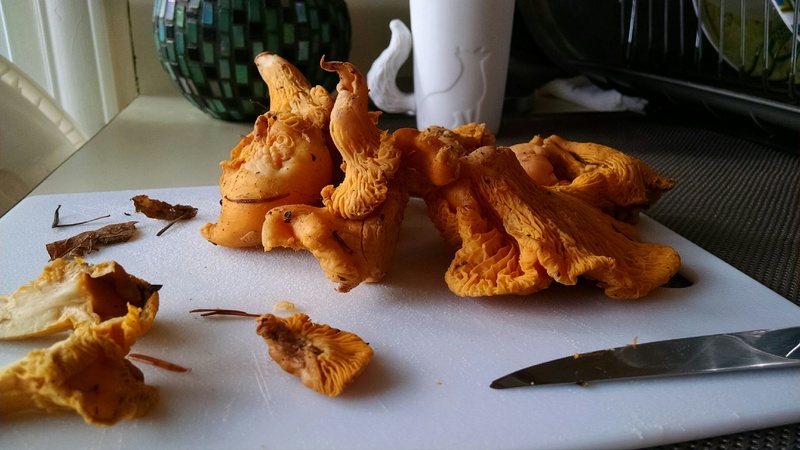 Nothing says fall in the Pacific Northwest like the chanterelle mushroom. Easily identifiable and among the most popular of the edible mushrooms, the golden chanterelle is prized by amateurs and restauranteurs alike for its fruity, earthy, sometimes spicy fragrance and flavor. Some of my friends enjoy foraging for these fungi in and around Seattle and Eric The Barter offered to trade me and Gregory some in exchange for a home-brewed beer that would incorporate the chanties. 0.75 oz. Czech Saaz (Pellet, 3.2% AA) @ 90 min. 1.50 0z. Czech Saaz (Pellet, 3.2% AA) @ 30 min. 1.50 oz. Czech Saaz (Pellet, 3.2% AA) @ 10 min. 0.50 oz. US Cascade (Pellet, 7.0% AA) @ 0 min. 11.03.14 – Made a stir-plate 2L starter with 1 Wyeast 3522 smack pack. Brewtoad suggests 284 billion cells to ferment 5 gal. Cold crashed and decanted morning of brew day. 11.05.14 – Chilled wort to 65F before pitching yeast starter and put it onto brewbelt. 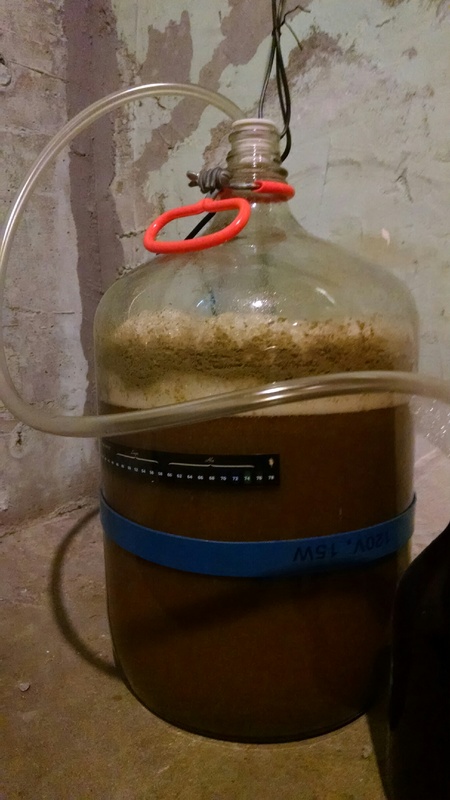 11.06.14 – Vigorous fermentation and holding steady at 75-78F. 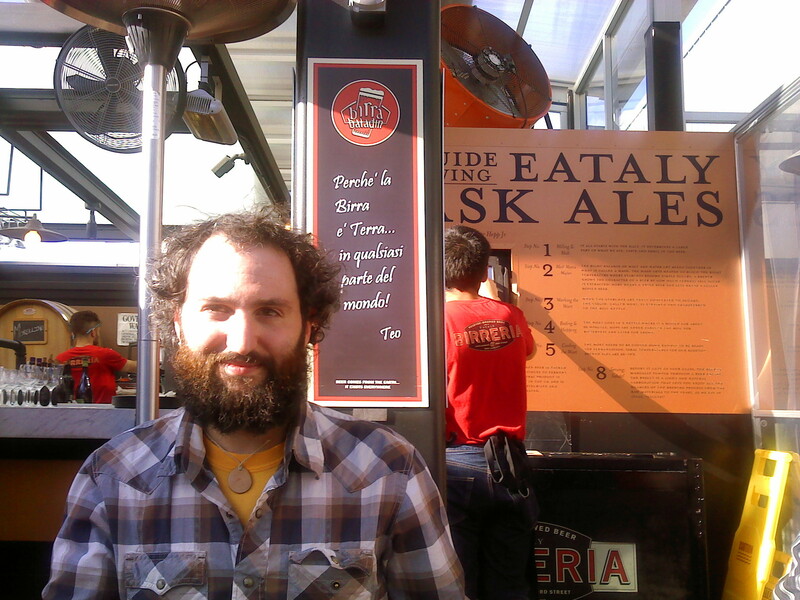 11.09.14 – Fermentation has slowed and krausen has dissipated. Holding steady at 74-76F. Replaced blow-off tube with airlock. 11.20.14 – Transferred base beer into secondary fermentor and added the thawed chanterelle mushrooms and their liquid; brewbelt no longer used. 12.17.14 – Transferred off of mushrooms into tertiary fermentor to condition. 01.07.15 – Bottled chanterelle beer with 3.5 oz corn sugar @ 2.2 volumes of CO2. Cracked a bottle tonight nearly three months after bottling; the beer is perfectly carbonated and has a slight haze to its russet brown color. It has a lovely aroma featuring a sweetish apricot-like fruitiness from the chanterelles, underlying spicy phenolics from the Belgian yeast, and hints of alcohol. The beer starts out fairly malty with a round honey-like sweetness on the palate which gives way to fruity yeast esters and the fruity, earthy qualities of the chanterelle mushrooms. It finishes on the dry side with moderate warming from the alcohol which also balances the initial sweetness. A lovely beer. I’ll leave my despise for Denny Conn at the door. They have a mushroom brown at Ahnapee brewing that is fantastic. Looks like the perfect recipe for the subtle flavors of them. This is my favorite beer! Thanks for brewing it. So delicious, and intoxicating! Great work!